The Welsh Terrier dog breed‘s zest for life is contagious, and he always enjoys himself to the fullest. Bred to hunt independently, with all the self-determination and intelligence that entails, the happy and lively Welshie rarely gets tired and wants to spend his days having fun, fun, fun. His joy, his attitude, and his brains all add up to one wonderful package: He’s a true Terrier. See below for complete list of Welsh Terrier characteristics! 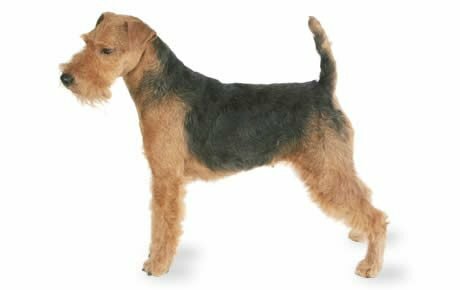 He may look like a small Airedale, but the Welsh Terrier has his own personality. It's certainly a strong personality, and no wonder — he was bred to hunt badgers, foxes, and otters. Although not many folks hunt badgers these days, hunting cookies in the yard is a solid alternative. Smart as can be, this party boy excels in agility, flyball, tracking, earthdog, and obedience competitions. He's also been involved in both search and rescue work and therapy. The Welshie is a lot of dog in a medium-sized package, and first-time owners would do better with a less independent breed. However, other dog lovers may wish to step up to the challenge of life with a freethinker whose prime desire has nothing to do with pleasing you. He's a problem solver, which can be wonderful and terrifying. Don't underestimate his problem-solving skills, because if he's bored, that's a problem to be solved. He's not for the faint of heart, or for those looking for a quiet companion or for instant obedience. As a matter of fact, obedience might be a long time in coming — but it will eventually, with repeated effort. He needs intellectual stimulation, and if you can provide that in his training, there'll be no stopping him in competition. First and foremost, this boy has to burn off steam every day or you'll be scraping him off the ceiling. He has a ton of energy and requires — not just needs — an hour of exercise every day. If you're looking for a jogging companion, he's your man; and he'll be up early brewing your coffee while waiting for you to get your running shoes on. Regardless of how much exercise he gets, you should still expect to see some rough play in the house that can result in Welsh Terriers flying off couches or knocking over lamps. They're surprisingly tough when it comes to this kind of play (whereas some gentler canine souls dislike the wild play of children). The kids will have a great time with him as they roughhouse — and nap — together; Welshies are terrific with kids. A word of caution: If you play with your Welsh Terrier inside the house, don't expect him to not race through the house at other times. It becomes an accepted behavior, and he'll launch himself off furniture whenever the mood hits. And that might be often, since he enjoys being in high altitudes and will frequently relax on picnic benches and tables. A Welshie is intelligent, and while that helps him grasp concepts easily, he can be difficult to train. You won't get anywhere with boring, rote lessons — in fact, repetition is the best way to get a Welsh Terrier to ignore you. On the other hand, you'll be amazed at what you can accomplish with fun, positive training that convinces him that you're the one in charge. He was bred to be freethinking, like a child of the sixties, so if you work with this trait instead of against it, you'll have more fun than you can imagine. He can do well in homes with other dogs, but he needs to be properly socialized to keep him from being dog-aggressive. He's definitely not recommended for homes with small animals due to his strong prey drive. Although it's not ideal, the Welsh Terrier can live in an apartment. He's a born watchdog and will bark when he sees or hears something suspicious — which can be a problem in buildings with noise restrictions. A house with a small fenced yard is better suited to his energy and noise, particularly if you don't mind a few holes in the lawn here and there. Like many other terriers, the Welshie has a great time digging and can easily make a mess of gardens and yards. Despite his hardiness, he does better living indoors with the people he loves rather than outside in a kennel. The Welsh Terrier can be a perfect, devoted companion for an active family who has the time to care for him and meet his exercise requirements. He's independent enough to not yearn for or demand excessive attention, yet he's affectionate enough to enjoy time spent cuddling on the couch. He'll fill the house with the sounds of life and just might grace your furniture and tables. The Welsh Terrier is proof that life can be lived to the fullest and that not all good things come in big packages. A Welsh Terrier can do all right in apartments if properly exercised, but the ideal is a house with a fenced yard. As a low- to nonshedder, the Welshie can make a great companion for people with allergies. Expect a fair amount of grooming. Welshies need their coats brushed on a regular basis and also need their coats stripped about every eight weeks. Welsh Terriers can be difficult to train and require a consistent and fun training program. For this reason they aren't recommended for first-time owners. The Welsh Terrier is an independent breed not prone to separation anxiety. He will require toys and activities to keep him entertained, since a bored Welsh Terrier can become destructive. They like to be up in high places and will climb onto tables and other high furniture. Like many terriers, the Welshie has a strong prey drive. Welsh Terriers can be combative with other dogs and need to be properly socialized from an early age. Barking and digging are common traits. Although the history of the Welsh Terrier is not completely clear, we can ascertain from paintings and prints that the breed is quite old and may have been one of the first Terriers. He was originally known as the Black-and-Tan Wire Haired Terrier or the Old English Terrier. Although associated with Wales, he lived in many parts of England during the 19th century. He was commonly used to hunt foxes, otters, and badgers, and he excelled at eradicating vermin. He was commonly shown and categorized as an Old English Terrier, a category under which many Terrier breeds were classified. It wasn't until 1885 that he was classified as a Welsh Terrier by the Kennel Club of England. Welsh Terriers began arriving in the United States in 1888, though their importation was erratic. By 1901, however, the Welsh Terrier finally established a footing in the United States, and his popularity grew at a steady pace. The Welsh Terrier is a medium-sized dog. The average height is 15 to 15.5 inches, females being slightly smaller than males. The average weight is usually 20 pounds, but weight should be in proportion to the height and bone density of each individual dog. The Welsh Terrier is a cheerful, intelligent dog who loves to have fun and is always affectionate. He's energetic and has a playful nature. Loyal and devoted to his family, he can nevertheless be quite the social butterfly. He loves to amuse both himself and his family, and he's not as hot-tempered as some other terrier breeds. His loving disposition and energy makes him an excellent family companion who's great with children. The Welshie can be independent, which may lead to some training difficulties (especially with inexperienced owners). But this is usually offset by what most people love best about the Welsh Terrier: his happy, fun-loving zest for life. Like every dog, the Welshie needs early socialization — exposure to many different people, sights, sounds, and experiences — when they're young. Socialization helps ensure that your Welshie puppy grows up to be a well-rounded dog. Welshies are generally healthy, but like all breeds, they're prone to certain health conditions. Not all Welshies will get any or all of these diseases, but it's important to be aware of them if you're considering this breed. In Welshies, you should expect to see health clearances from the Orthopedic Foundation for Animals (OFA) for hip dysplasia (with a score of fair or better), elbow dysplasia, hypothyroidism, and von Willebrand's disease; from Auburn University for thrombopathia; and from the Canine Eye Registry Foundation (CERF) certifying that eyes are normal. You can confirm health clearances by checking the OFA web site (offa.org). Allergies: Allergies are a common ailment in dogs, and the Welsh Terrier is no exception. There are three main types of allergies: food allergies, which are treated by eliminating certain foods from the dog's diet; contact allergies, which are caused by a reaction to a topical substance such as bedding, flea powders, dog shampoos, and other chemicals; and inhalant allergies, which are caused by airborne allergens such as pollen, dust, and mildew. Treatment varies according to the cause and may include dietary restrictions, medications, and environmental changes. Epilepsy: This is a neurological condition that's often, but not always, inherited. It can cause mild or severe seizures that may show themselves as unusual behavior (such as running frantically as if being chased, staggering, or hiding) or even by falling down, limbs rigid, and losing consciousness. Seizures are frightening to watch, but the long-term prognosis for dogs with idiopathic epilepsy is generally very good. It's important to take your dog to the vet for proper diagnosis (especially since seizures can have other causes) and treatment. Glaucoma: This is a painful disease in which pressure in the eye is abnormally high due to improper drainage of normal eye fluids. This causes damage to the optic nerve, resulting in vision loss and blindness. Glaucoma may be hereditary, or it may be the result of some other problem in the eye, such as inflammation, a tumor, or injury. The affected eye will be red, teary, squinty, and appear painful; the front of the eye will have a whitish, almost blue cloudiness. Vision loss and eventually blindness will result, sometimes even when treated with surgery or medication. Hypothyroidism: Hypothyroidism is a disorder of the thyroid gland. It's thought to be responsible for conditions such as epilepsy, alopecia (hair loss), obesity, lethargy, hyperpigmentation, pyoderma, and other skin conditions. It is treated with medication and diet. Training a Welsh Terrier can be a study in who is more determined, the trainer who's trying to get the Terrier to listen, or the bored Terrier who's ignoring the trainer. The Welshie is known for having a mind of his own and he's not the most obedient of breeds — he's no sunny Golden Retriever — so he will often test limits. Train him with positive reinforcement and consistency. Harsh corrections can shut down any chance at getting through to him. The Welsh Terrier can also become bored easily, so he requires an interesting training routine. Breaking training up with fun games, keeping it free of repetition, and giving him something to work for are excellent ways to get him more interested in training. Socialization is important with a Welsh Terrier. He can be combative with other dogs and animals, but this trait can be corrected with proper training and early and ongoing socialization. In fact, Welsh Terriers generally do well with other dogs once they're socialized. A Welsh Terrier is a high-energy dog. Even with a vigorous exercise routine, you should expect some of that energy to be converted into room-crashing escapades that range throughout the house. 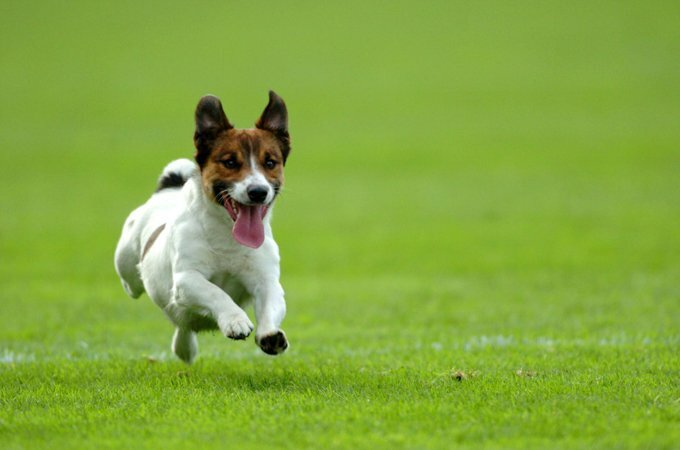 He should have a minimum of 30 to 60 minutes of daily exercise, which can be accomplished by playing in a yard or dog park (as long as he isn't too dog-aggressive to go to the dog park), playing in the house, or going on a long walk. Letting him hang in the yard by himself is not going to be enough — and he'll probably jump the fence. The Welsh Terrier is very fond of toys and will burn off ample energy playing by himself with his favorite squeaky toy. He can also make an excellent jogging companion, though his high prey drive means you should keep him leashed on walks. Crate training benefits every dog and is a kind way to ensure that your Welshie doesn't have accidents in the house or get into things he shouldn't. A crate is also a place where he can retreat for a nap. Crate training at a young age will help your Welshie accept confinement if he ever needs to be boarded or hospitalized. Never stick your Welshie in a crate all day long, however. It's not a jail, and he shouldn't spend more than a few hours at a time in it except when he's sleeping at night. Welshies are people dogs, and they aren't meant to spend their lives locked up in a crate or kennel. Although it's not ideal, the Welsh Terrier can live in an apartment. He will bark, though, and this can become a problem in buildings with noise restrictions. A house with a small, fenced yard is better. Also, he needs to live indoors with the people he loves. Recommended daily amount: 3/4 to 1 cup of high-quality dry food a day, divided into two meals. Keep your Welshie in good shape by measuring his food and feeding him twice a day rather than leaving food out all the time. If you're unsure whether he's overweight, give him the eye test and the hands-on test. For more on feeding your Welshie, see our guidelines for buying the right food, feeding your puppy, and feeding your adult dog. Sporting two coats to waterproof himself, the Welsh Terrier has an outer coat that's hard and wiry and an undercoat that's soft and short. He only has one color pattern: tan and black. A non- to light shedder, the Welshie still requires a fair amount of grooming. He should be brushed at least once per week, although it's frankly better to do it every other day. Unless he's clipped, that wiry coat will need to be stripped several times a year to remove any loose or dead hair and to prevent it from matting. Brush your Welshie's teeth at least two or three times a week to remove tartar buildup and the bacteria that lurk inside it. Daily brushing is even better if you want to prevent gum disease and bad breath. Begin accustoming your Welshie to being brushed and examined when he's a puppy. Handle his paws frequently — dogs are touchy about their feet — and look inside his mouth. Make grooming a positive experience filled with praise and rewards, and you'll lay the groundwork for easy veterinary exams and other handling when he's an adult. The Welsh Terrier is a loving dog who can be patient when he needs to be. Add to that a hardiness that allows him to enjoy a fair amount of roughhousing, and you'll find that he makes a wonderful companion for children. As with every breed, you should always teach children how to approach and touch dogs, and always supervise any interactions between dogs and young children to prevent any biting or ear or tail pulling on the part of either party. Teach your child never to approach any dog while he's eating or sleeping or to try to take the dog's food away. No dog, no matter how friendly, should ever be left unsupervised with a child. He's also basically compatible with other dogs and can do well in homes where he isn't the only canine companion. He is a Terrier though, and he may be dog-aggressive if not properly socialized or trained. He's not recommended for homes with small pets that might be viewed as prey, because all Terriers have a strong prey drive and will give chase. Welshies are sometimes bought without any clear understanding of what goes into owning one. These dogs may end up in need of adoption or fostering.